American beat Army 71-68 Saturday to improve to 13-10, 7-5 in the Patriot League. See below for five key plays/sequences from the game, including Jacob Boonyasith’s career-high day and Sa’eed Nelson’s near triple-double. For whatever reason, American came out looking like the team that had several poor starts earlier in the year. The Eagles turned the ball over eight times in the first six minutes with just one field goal and trailed 11-3. After a rough first half during which American shot just 11-for-25 with nine turnovers, the Eagles came out unstoppable to start the second half led by Jacob Boonyasith. The freshman, who had just three points in the opening 20 minutes, set the tone with a pull-up jumper and the Eagles scored on 16 of 21 possessions to quickly take the lead and then build it to double-digits. 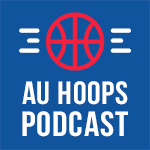 Whether it was Boonyasith creating, Nelson feeding Mark Gasperini on screen-and-rolls, or Stacy Beckton Jr. scoring from the wing, AU had it all rolling in the second half. Entering Saturday, the freshman had made nine 2-point field goals all season. He had seven against the Black Knights. Boonyasith scored on pull-up jumpers, on drives with both hands, and on a backdoor cut. ”It just opened up the floor for everybody,” Nelson said of Boonyasith. “It’s easy for guys to see me and think I’m the only one doing something so they just pack the paint. So to have other guys be aggressive and get easy shots and easy layups — it’s going to help us now and down the line.” Boonyasith finished with 20 points on 8-for-11 shooting. The junior came one rebound shy of American’s first triple-double since 1979, finishing with 11 points, 11 assists and nine boards. Nelson controlled the game – particularly in the second half — on both ends, picking his own spots, reading the 1-5 screen-and-roll to perfection (an array of passes to the bigs cutting to the basket and wings for 3), and making offense happen in transition. The Black Knights entered the game having made at least six 3s in every game. They had gone 285 games, dating back to 2009, with at least one triple. Yet on Saturday, they couldn’t buy a basket from the perimeter — finishing 0-for-16 from deep. Army had several great looks and John Emezie (a 38% shooter) had a wide-open look with 3 seconds left after a heads-up pass from Matt Wilson, but that one just grazed the rim and American survived with plenty of help from its cold-shooting opponent.